A few months ago I and two long time friends embarked on a project to implement an iOS-based application starting with the iPhone and moving towards the iPad. We already had a corporation set up from some previous ventures and were primed and ready to go when an opportunity fell into our laps. I was contacted by Michael Schacht concerning iOS implementations of a couple of his older and lesser known titles and over the course of a few weeks, he and I were able to work out a licensing agreement to start with one of his games. Michael and I, although we’ve never met, have exchanged numerous emails in the past concerning my implementation of his game, Coloretto and the hosting of it on his own site. When he contacted me concerning in iOS implementation I got very excited. 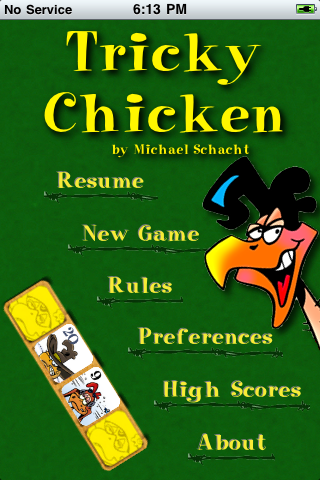 Unfortunately, Coloretto was not up for grabs (that would be a great game on the iPad) but an older game Crazy Chicken was available. Unfortunately, we’ve run aground on the name. 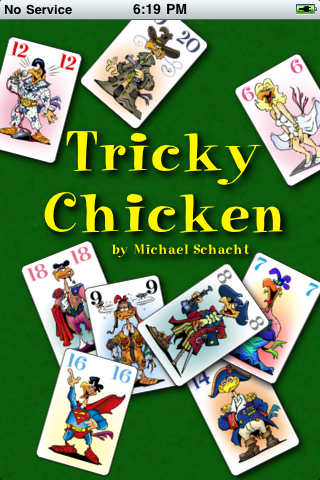 A German company produces DVD-based videos and games under the name Crazy Chicken so we’ve gone with Tricky Chicken as a play on words for card tricks and it carries over some of the feel of the crazy illustrations. We liked “Whacky Chicken” but alas, in German, the word whacky doesn’t have that same je ne sais quoi that you’d hope for. However, I’m proud to say that development has been coming along nicely although I’ve been struggling greatly with some Core Animation glitches on slower 2G iPhones. On faster 3G and 4G phones it doesn’t seem to be a problem. Here are some early screen shots of some of the game. I’m sure some aspects will change but that’s what we’re working with so far. The game currently allows for one on one play (you against the computer) as the original game was designed. A later incarnation of the game called “Drive” that had different artwork and some minor rules changes to support a 3rd and 4th player are not supported. We’re excited to be bringing a little known but very neat game to the iOS platform and we’re working hard to get it polished off and available in the App Store. 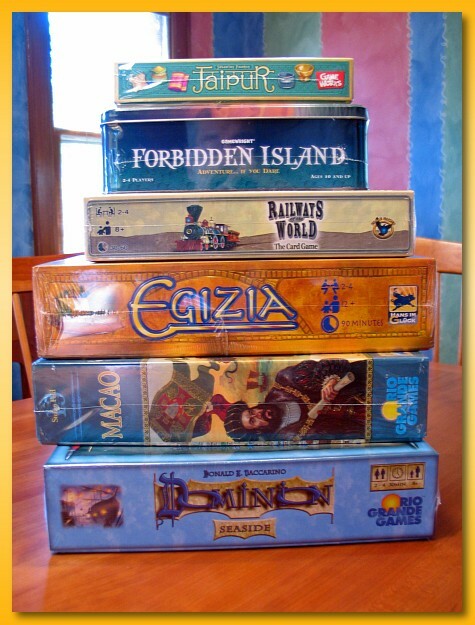 Five of us met at my house for August’s installment of Analog Game Night. We expected to get in a game of Witch’s Brew, Carson City, and High Society but we decided to dig into Carson City first. Carson City is touted as being Caylus-like and since we groove on that game we dug into the rules explanation and with all the moving parts we didn’t come out into the light until about an hour later. Yes…an hour. With the iconography and the in-game/rule text inconsistencies it took us a long time to understand relatively simple concepts that become clear after the first full play. For example, we kept thinking that a parcel was represented by the player’s colored square and that was confusing us when the Ranch payouts referred to free parcels. Once we understood that a parcel was any plot of land in the grid, then it made more sense. Carson City is a odd bird. It’s a cross between Oregon, Caylus, and Bang!. 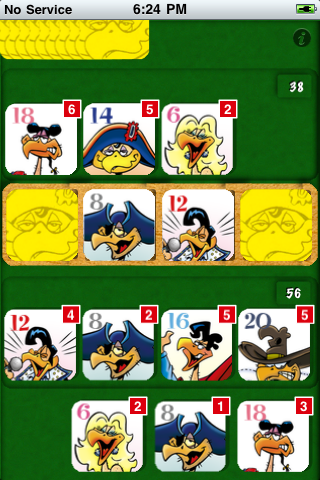 Players first, according to turn order, choose a role placard that grants the player a special ability or action and indicates the players turn order in later phases of the round. In addition, the placard indicates how much money the player is allowed to roll over into the next round. Once selected, players place cowboys on a track of “actions” somewhat like the Caylus “road” but it’s prebuilt and the buildings on the road are pulled randomly from a bag. Besides buildings, the road contains various actions and payouts. Players are allowed to place their cowboys on the same spot as others but in most instances that triggers a duel. 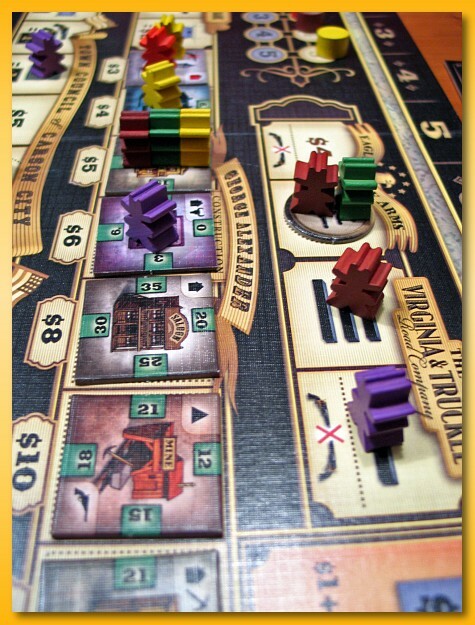 In addition to the road, players also place cowboys on a grid of land parcels on the board indicating a desire to establish ownership of the parcel or steal income from an existing property. Once all cowboys have been placed (players can pass before placing all their cowboys), the actions of the road are taken one by one, duels fought, parcels purchased, payouts granted, etc. until the items on the road are exhausted. When buildings are purchased, players build them on owned parcels and certain bonuses are granted based on what other properties are near the building (similar to Oregon) or on the board. Depending on the building built, additional houses or roads must be built to satisfy placement requirements. The duels can be relatively devastating. They’re played with dice augmented by a number of gun tokens amassed during play. One role card affords the owner a boost of three guns for the round. The loser of the duel gets his cowboy back which acts as an additional gun in subsequent duels this round but also rolled over into the subsequent round affording the player an additional “worker” for placement. At round end, players must shed all moneys larger than their role affords them by either dumping it or buying victory points at an exorbitant price of $10/pt, and then take a fixed number of cowboys indicated by the round (carrying over any cowboys that lost duels). At game end players score their owned parcels and buildings, shed money by buying victory points and the player with the most is the winner. I liked the game but there are a lot of moving parts. In my opinion is a much harder game than Caylus to predict the payoff of any particular move. The duels introduce a bit of chaos in the game but it’s the sheer number of variables that go into making a decision that make my head spin. I’d like to play again but I may need some ice water handy to cool off my brain once in a while. Unfortunately, we didn’t get to play Witch’s Brew but closed the night with a quick game of High Society. HS is a filler game much like For Sale that I may actually like a bit more although it’s a hard call to make. Well, thanks for coming guys and see you all next month.